Lim Yoo Jong was a strong Korean amateur player (4-5 dan in France, EGD information) who lived in France since the sixties. He taught many players and was a key figure in developing Go in France. 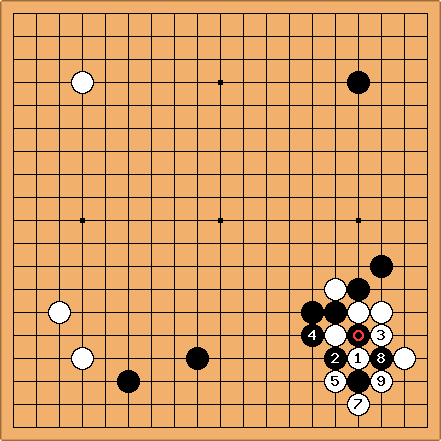 (See the History of Go in France 1965 - 2007). He died in September 2016. From December 2009 onwards, Maître Lim (as he is known in France) occasionally played on KGS, using the account MaitreLim. Depending on a ladder, White can play 5 at 6. See any standard joseki book for continuations: it can get a bit complicated. Black's eyes are not as well-defined as in the main line joseki, but White has one less ko threat here than in the standard joseki. 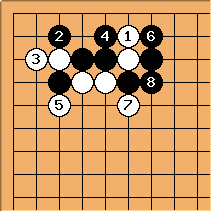 Also White has no scope for variation. 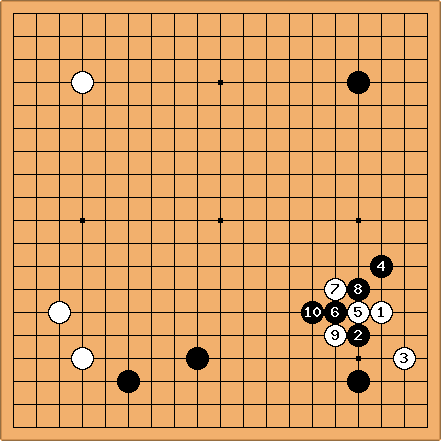 Lim maintained that this is superior to the main line joseki. Several professional players have been asked their opinion on the question. As I (Malcolm) understand, they prefer the standard joseki. According to Lim, Farid Ben Malek asked Otake about it when he was at the Nihon Ki-in. Otake had never considered Lim's move. Lim would encourage you to make up your own mind, and not to rely on other people... I think he has a point here. Maybe in this case it's a matter of taste. At any rate, it's good to know that this alternative exists. The following gives Lim's take on a common family of fuseki. 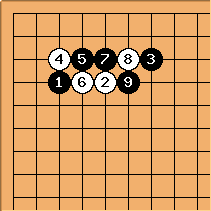 According to Lim, both 3 and 4 are mistakes. 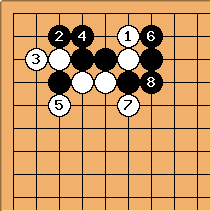 "After , the game is difficult for Black for three reasons. First, Black's lower-side territory is still open. Second, still has some life in it. 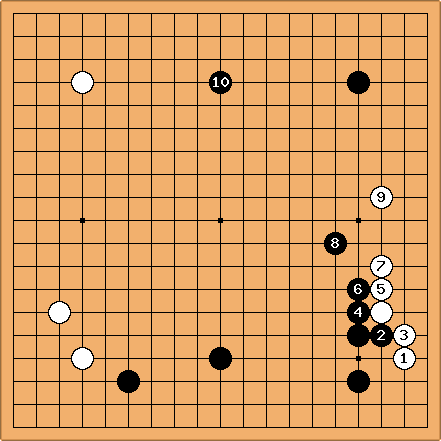 Third, White has gained a good ten points in the corner." " - - - are forced. dominates the whole board. Some might say is premature. It isn't. It's an immediate punishment of . If is played at a later stage, White won't answer at ." " isn't an invasion, merely a large point. It's strategically unimportant. White won't be brave enough to play at 'a'. According to Kobayashi Koichi, making only one single territory isn't a good idea. The author doesn't agree. 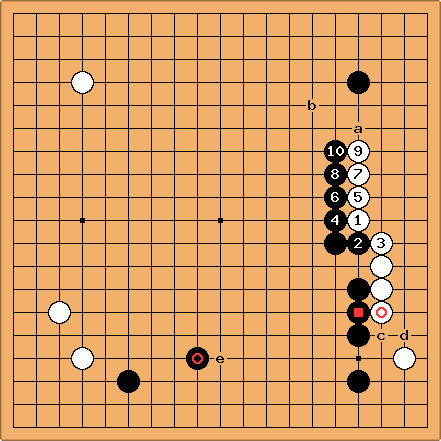 In the opening, playing six moves on the second and third line is catastrophic, unless the 'black valley' is destroyed. White will have to risk everything on an invasion at 'b'. 8 [previous diagram] will glare down at the invader." Blitzcrank: I added 'a' in the diagram, according to the original source. "White can't play at nor at (check for yourself). 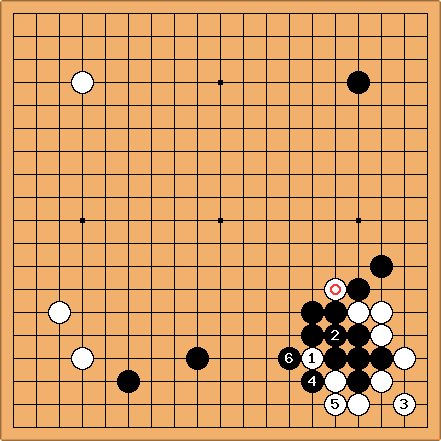 White has around twenty points on the right side, while Black's moyo is a small-scale version of the Arizona grand canyon"
In this version Black omits the exchange 'c'-'d', and the stone at 'e' is now at . Another thing: Lim preferred the high approach (placing at ). A new article (in French, 2009) on the tengen! I (Malcolm) think Dan-level players will be able to get something out of it even without reading the French. This blog post in English and French gives two of his games. Article in French with photos and links to many articles written by Lim: link.